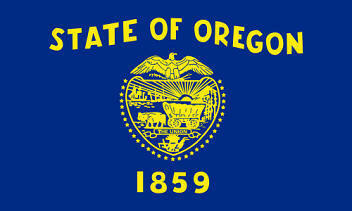 The blue State Flag of Oregon proudly displays its name over a gold image of the state seal. The seal depicts the image of a protective eagle over pictures representing the state and symbols important to its history and early economy. It serves as a symbol of honor, heritage and regional pride and is displayed at state buildings. There is a strict Order of Precedence for flags. State Flags are displayed in order as they entered the Union. Car Flags are often displayed to represent of an individual's allegiance to their state. Oregon State car flags are used by their owners as mobile emblems of their home. Car flags are usually made from strong materials and are attached to a car via a pole and clip window attachment. What is the design of the Oregon state flag? 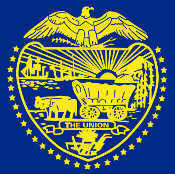 The obverse (front) design is a field of blue containing a gold image of the Seal of Oregon. The reverse side features a picture of a beaver. What does the beaver symbolize? Beaver fur was the raw material for a high quality felt that was used for hat making. Million of hats were made from beaver skins and were the first great American trade commodity. What does the date symbolize on the Oregon flag? What do the images on the seal symbolize on the Oregon flag? The British man-of-war symbolizes the departure of British influence in the region and an arriving American merchant ship symbolizing the rise of American power. The ratio of the Oregon flag is 3:5 meaning it is 3 units tall for every 5 units wide. Who designed the Oregon State Flag? What is the history of the Oregon State Flag? The flag was designed in response to a postmaster’s request for an official flag to send to Washington, D.C., to be displayed with the other state flags. 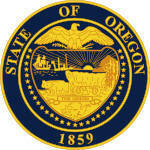 The Oregon flag is kept and used as required by the code specified in the constitution of the state.